Be the first to share your favorite memory, photo or story of Jai'Quaune. This memorial page is dedicated for family, friends and future generations to celebrate the life of their loved one. 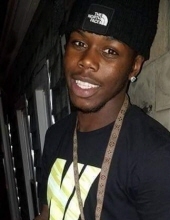 Jai’Quaune Aikeeme Freeman, 23, died on March 17, 2019. He was born on August 24, 1995 in Columbia, SC to Towanna James-Jamison and Joseph Freeman. He was the step-son of Anthony Jamison. Jai’Quaune was a member of the Fairview Full Gospel Missionary Baptist Church. Jai’Quaune is survived by three brothers Anthony Jr., and Jakyric of York, PA and Joseph Freeman of SC; three sisters Sejada of York, PA and Yashicha and Tajhyma of SC; seven uncles Charles (Chris) of El Paso, TX; Norris (Theresa) and Mark (Nicole) of York, PA; Steven (Tonya) of Atlanta, GA; Isaac (Ree) and Roger of SC and Anthony Freeman, Sr of SC. ; three aunts Sandra James of SC; Dean and Gloria Freeman of SC; and Kietta Watkins. Jai’Quaune was preceded in death by both maternal and paternal grandparents and a very special uncle, Johnnie James. Jai’Quaune also leaves a host of cousins and friends that will miss him dearly. To send flowers or a remembrance gift to the family of Jai'Quaune Aikeeme Freeman, please visit our Tribute Store. Or, if you would like to donate to the family, please visit Jai'Quaune's Tribute Fund. Help ease the financial burden placed on the Freeman Family after the loss of a loved one by making a donation. "Email Address" would like to share the life celebration of Jai'Quaune Aikeeme Freeman. Click on the "link" to go to share a favorite memory or leave a condolence message for the family. Provide comfort by sending fresh flowers from our local florist or donating to Jai'Quaune's Tribute Fund.